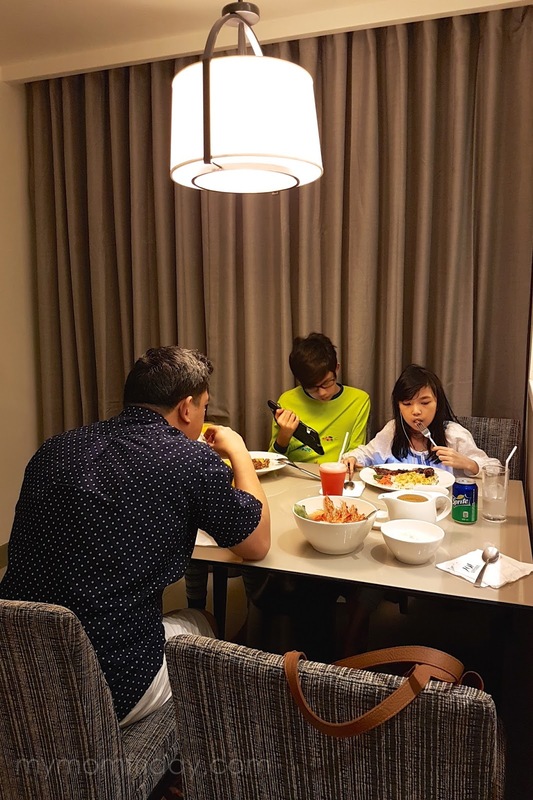 December na, and this season is all about gift-giving and lots of eating! I have not prepared any new dish or dessert that I feel worthy of serving during holiday parties. 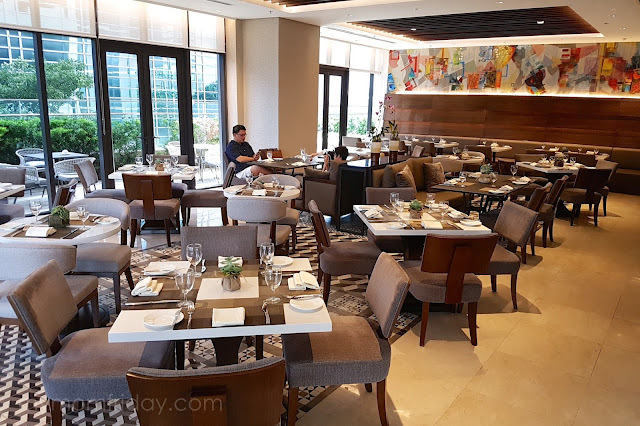 Instead, I am sharing my foodie discoveries at Cafe Madrigal and Bar from our recent staycation at the first serviced residence in the south, Somerset Alabang Manila. 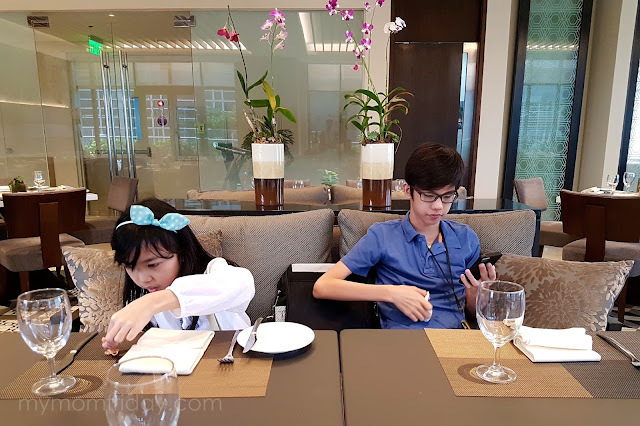 We arrived at Somerset Alabang before noon and we were immediately led to their in-house restaurant, Cafe Madrigal and Bar. I was looking forward to try the recommended dishes. Every time we dine at a new place, I try their specialties or order something different from the usual, and that's what I did. 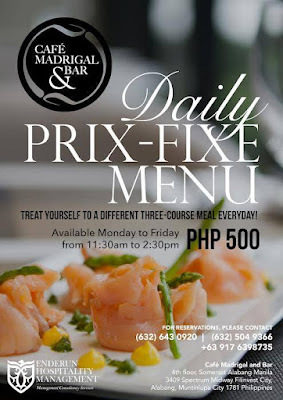 Here are my top picks from Cafe Madrigal. J and I started with soup... and they were so so good and comforting! Pot of piping hot broth on the side, poured over the bowl when you're ready to slurp. 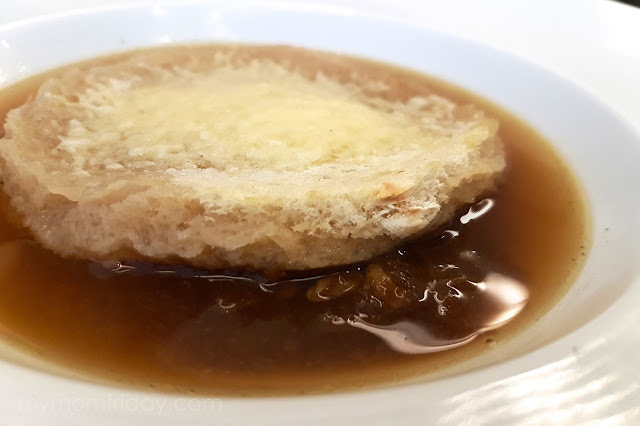 I tried a spoonful of broth with cheesy toast and it was delish! Creamy pumpkin-almond wanton with speculoos crumble. You can definitely taste that nutmeg-cinnamon kick and crunch in the soup. Loved the contrast in texture. Not your usual, and I like it! 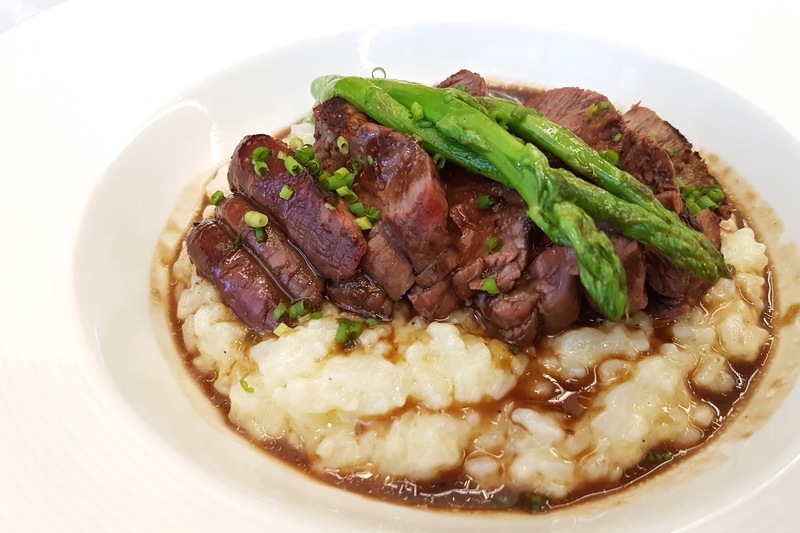 Beef Tenderloin with truffle risotto, asparagus, and red wine sauce. The meat was prefect medium well on a bed of fragrant, flavorful and creamy risotto. So delicious! Nakiki-sandok ako, hahaha...wiped out! 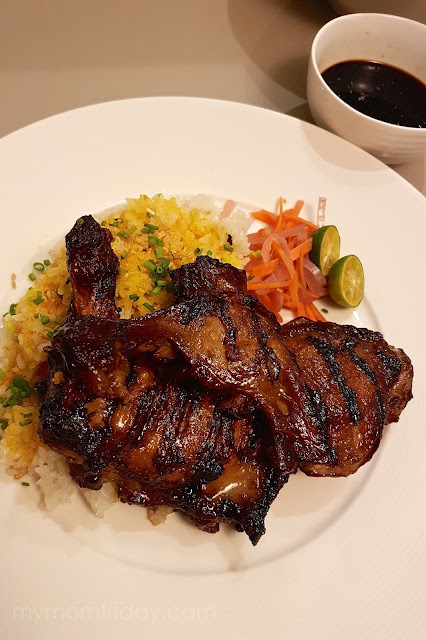 Grilled Half Chicken Inasal was well marinated and tender. 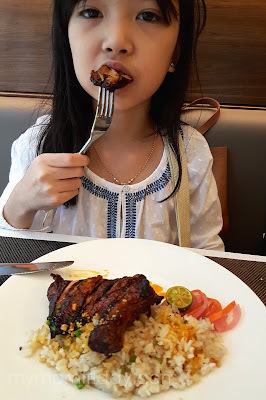 A safe choice for kids coz it's really tasty and grilled to perfection. Served with java rice. This was the girl's lunch AND dinner! =) First time nag-enjoy sa inihaw na manok! She only finished one hita. This can be good for two. 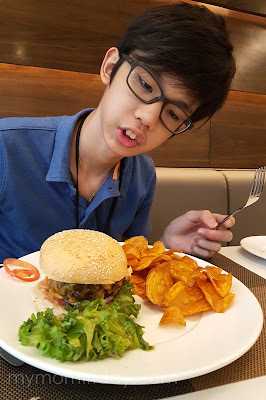 The boy had their All Beef Burger and it was thick and juicy when he started eating it. Was not able to try it though but he shared all his camote chips, heehee! Porchetta was my next choice coz J already got the beef with risotto. 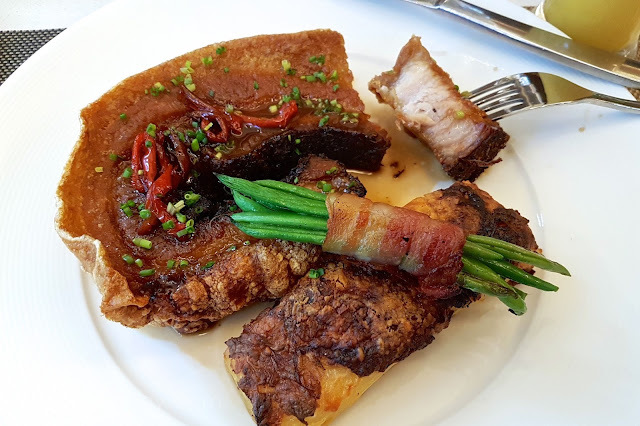 I intended to try different dishes and this slab of herb-flavored pork belly did not disappoint. Super lutong ng balat, parang chicharon! This was all mine, but I recommend this for sharing coz it's big. The potato gratin was also yummy but too hard to slice. 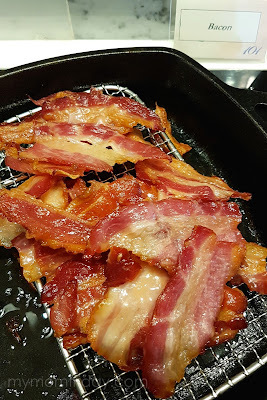 I gobbled up the beans in bacon. Afternoon snacks called for the usual French fries and fruit shakes for J and the kids. I tried the warm Spinach artichoke dip and it was addicting! 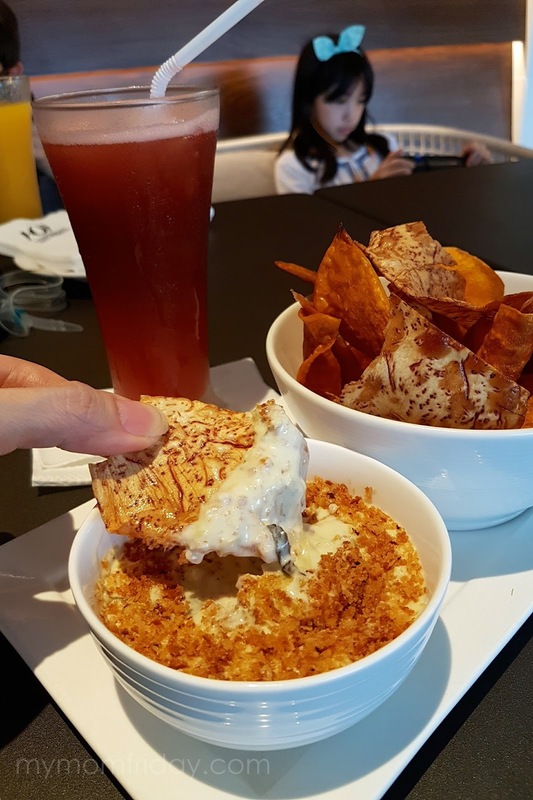 The thick and creamy dip complemented their homemade taro and camote chips. Again, meant for sharing and I was the only one eating this. Nakakabusog! 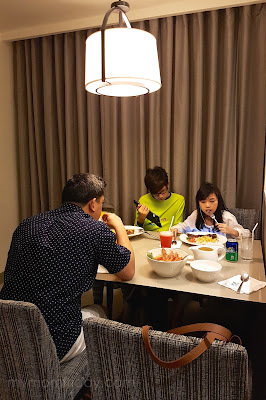 At every staycation, my kids will always request for room service. That's what we did for dinner. Nothing beats this classic -- made more delectable with tangy green mango sour broth, poured over your choice of seafood, served with steamed rice. 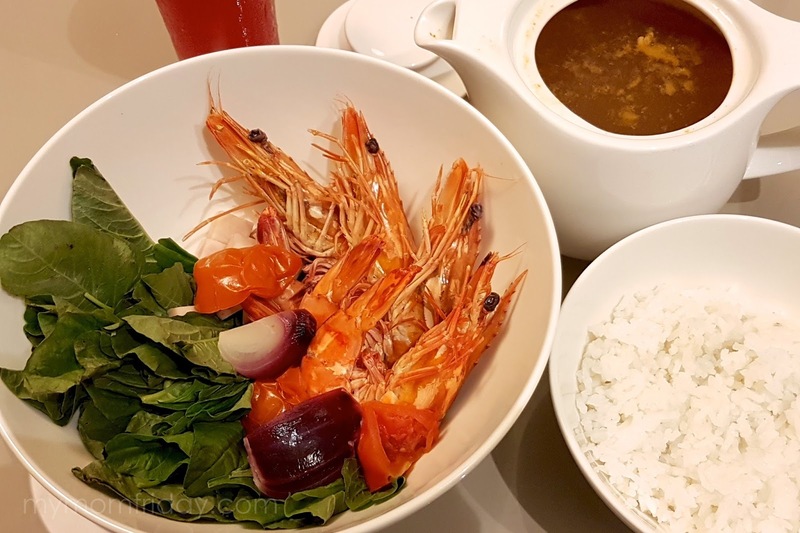 Prawn Sinigang was my choice for dinner. 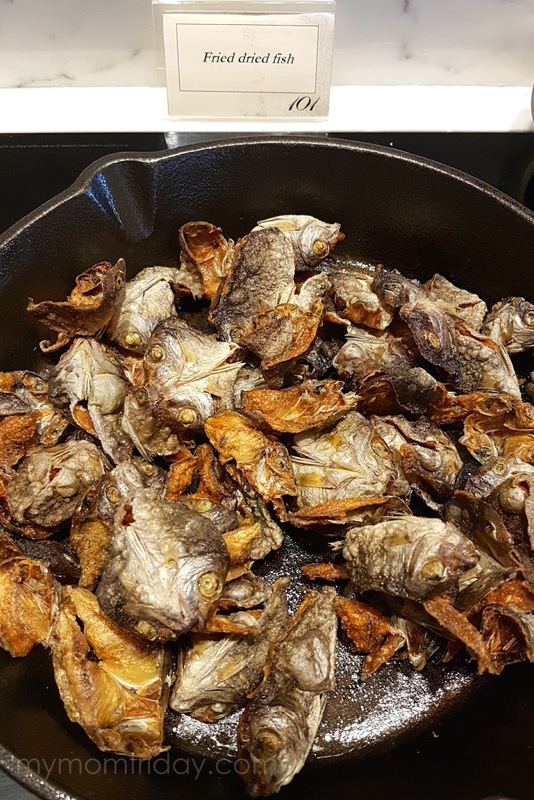 Sabaw pa lang ulam na. 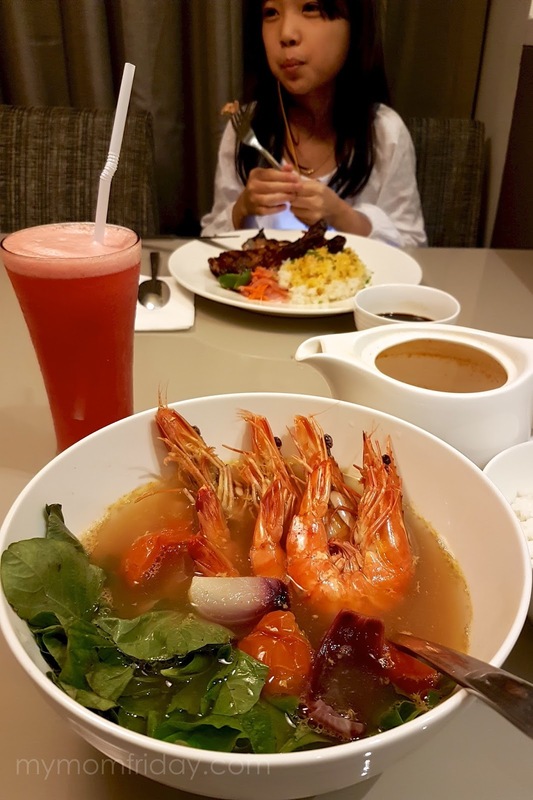 Busog-sarap talaga, I finished them all, even the rice! 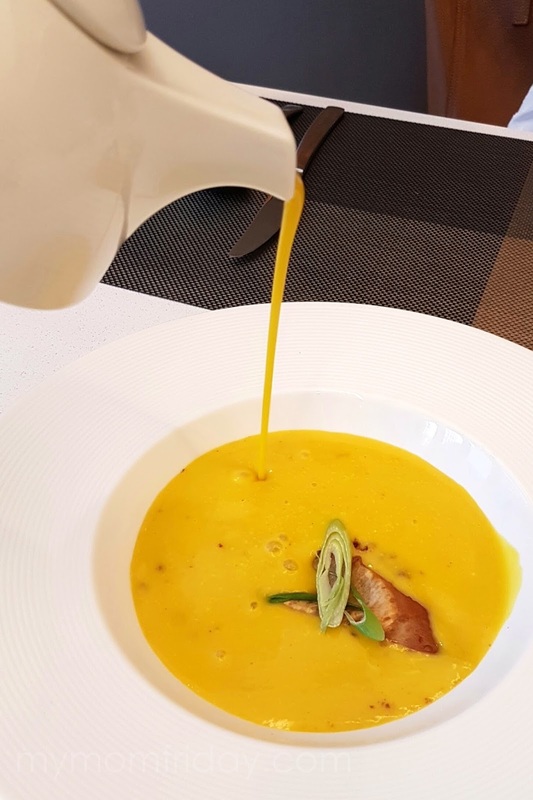 You have to watch how they served our soups! Katakam-takam! The morning after, a breakfast buffet was waiting at the cafe. Aside from the usual fares, what I enjoyed the most was this "eggs benedict" -- by order at the egg station. One egg lang actually. 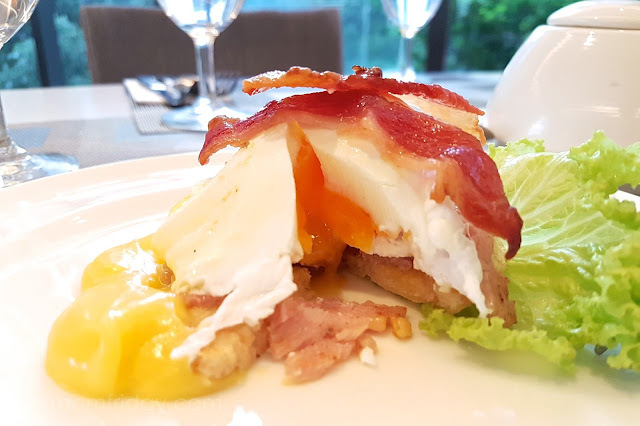 One beautiful runny egg on ham and toast with hollandaise sauce, topped with bacon. 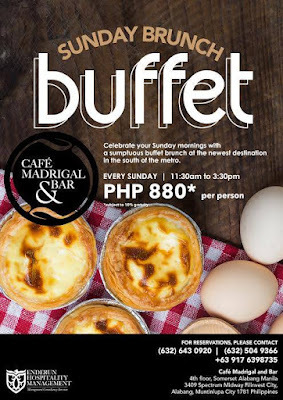 The size was just right coz it affords you to try other food from the buffet. 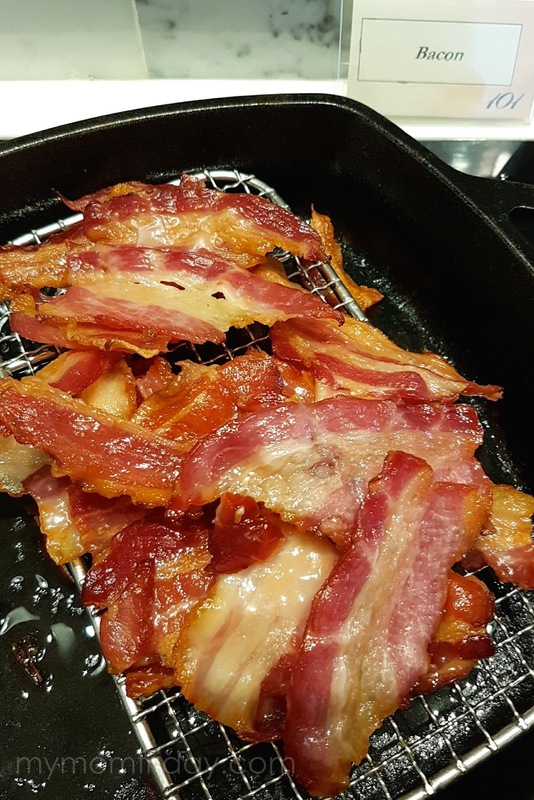 Of course, we all had our unlimited servings of crispy bacon with breads, and I even stuffed myself with some garlic rice because I didn't want skip the super crispy fried danggit! Cafe Madrigal and Bar has a lean but mean menu. 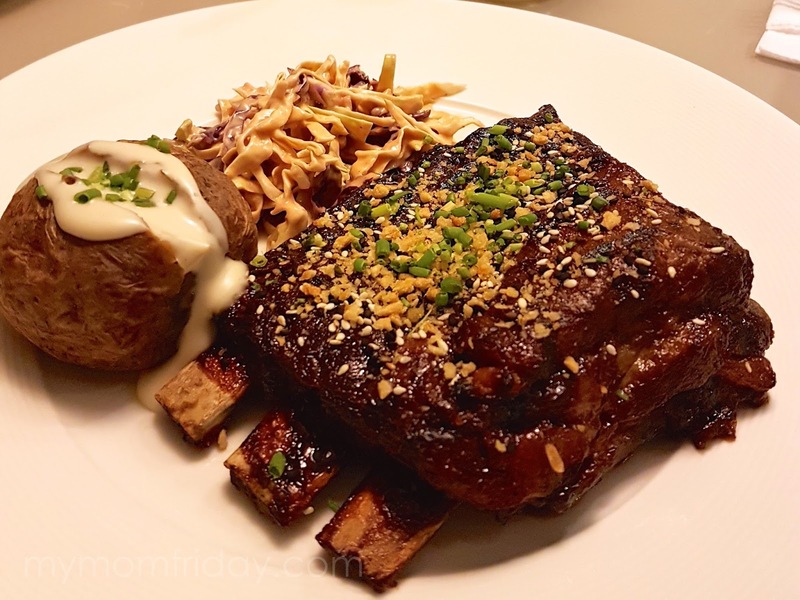 It's a family-friendly restaurant where you have find something for everyone. It's nice to wine and dine here with friends and loved ones any time you find yourself down south. 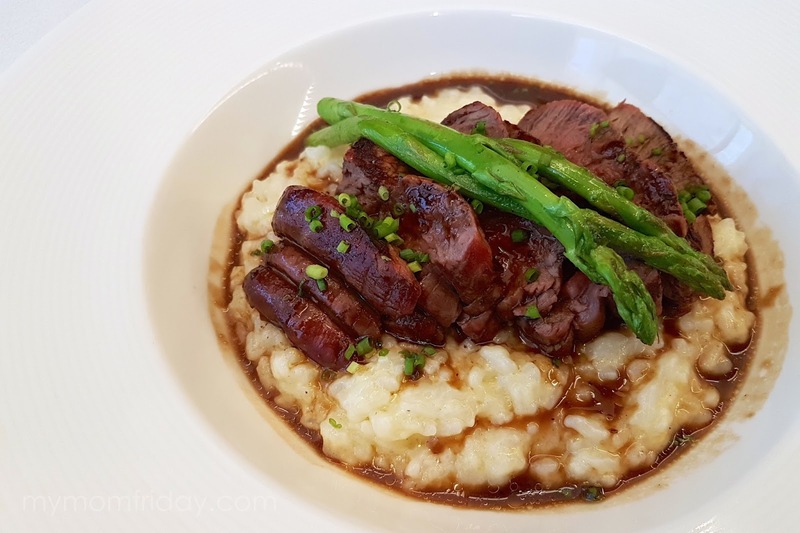 Check out their latest offerings at the cafe. Make Somerset Alabang a destination this coming holiday season!